The British Saddleback is the result of the mixture of two similar breeds, the Essex and Wessex Saddleback. 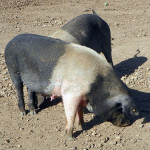 The Wessex Saddleback and the Essex Saddleback were black and white belted pigs in the west country as far back as the early 19thvcentury and were widely renonwed for their bacon. The Wessex had a denser population than the Essex and by the 1960s with the pig industry heavily focusing on white breeds the Wessex and Essex were merged to form the British Saddleback. The breed is now considered Minority rather than Rare and is spread throughout the majority of the UK. Whilst the origins of some pigs are rather hazy, the history of this Improved Essex pig is quite well documented. 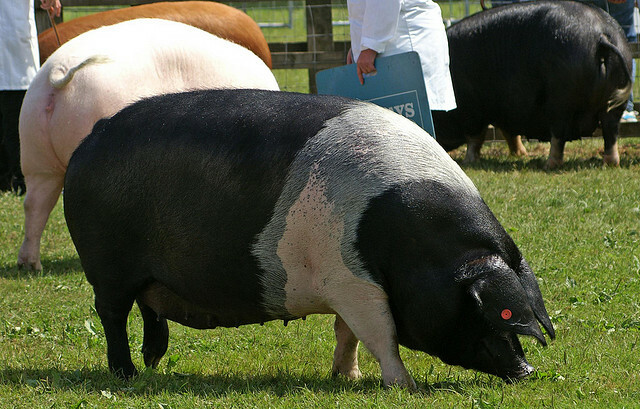 Lord Western, while travelling in Italy, saw some Neapolitan pigs and decided they were just what he needed to improve the breed of Essex pigs. 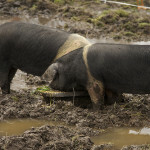 Lord Western aquired a pair of Neapolitans and crossed them with Essex sows. 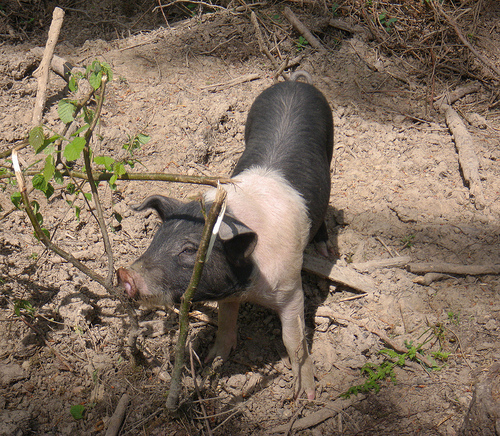 The Essex pig was mainly found in East Anglia. This pig had a black head and neck, as well as a clearly defined belt of white extending over the shoulders and continuing over the forelegs. The rest of the body was black with the exception of white feet and the tip of the tail. 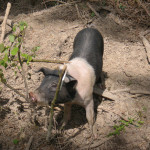 The Wessex originated in the New Forest as a cross between two indigenous old English bacon pigs. It was black all over, asides from a continuous belt of white hair over the forelegs and shoulder. 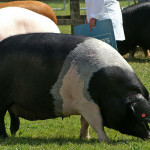 The two breeds enjoyed great popularity during the Second World War when 47% of the total pedigree sow registrations were from the Essex and Wessex breed. In 1949 there were 2,435 Essex and Wessex boars licensed. In 1954 they made up 22% of the total registrations for that year. The boars, however, had lost considerable ground to white breeds and in the same year less than 10% of the licensed boars were from the Essex and Wessex breeds. 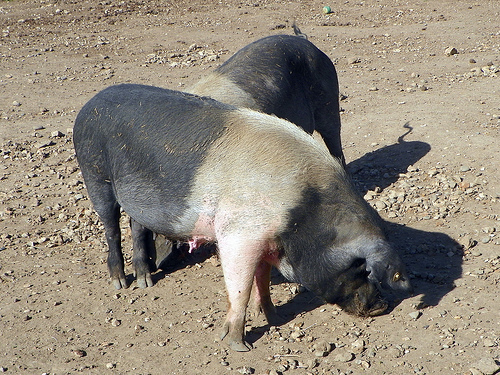 The recommendations of the time were to cross sows of either breed with a white boar to produce a dual-purpose pig for combined pork and bacon production. British Saddlebacks are hardy and noted for their mothering ability. The breed continues to be used mainly to provide coloured dams for the production of first-cross porkers, baconers and heavy pigs. The breed is known for its grazing ability and is very hardy. Black and white but with a continuous belt of white hair encircling the shoulders and forelegs. White is permissible on the nose, the tip of the tail and on the hind legs but no higher than the hock. Medium length, face very slightly dished, under-jaw clean-cut and free from jowl. Medium width between ears. Medium size, carried forward, curbing but not obscuring vision. Clean and of medium length. Medium width, free from coarseness, not too deep. Wide and not too deep. Broad and strong and free from slackness. Broad, full and well filled to hocks. Straight with at least twelve sound, evenly spaced and well placed teats starting well forward. Strong with good bone, straight, well-set on each corner of the body. Strong and of good size. 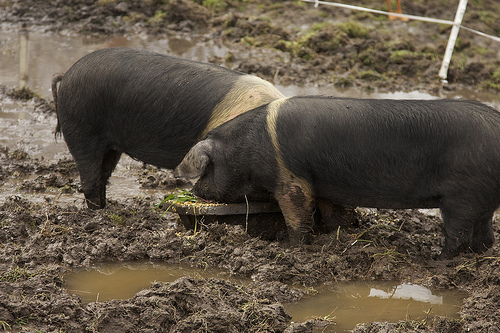 If you have any questions about Saddleback Pigs or any other pig breeds then please contact us.